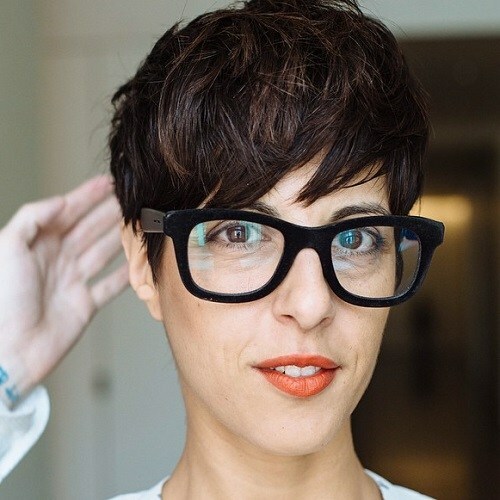 A pixie crop cut is the perfect low maintenance but high effect haircut that will show off your fabulous features. 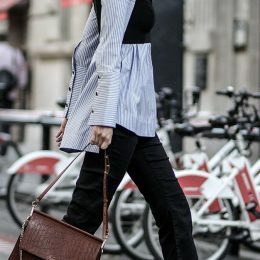 An incredibly feminine style that is surprisingly incredibly versatile given how little hair is involved – the pixie cut is a firm favourite of fashionistas all around the globe. Here’s our take on colourful pixie cuts that will make you want to reach for the scissors right away! 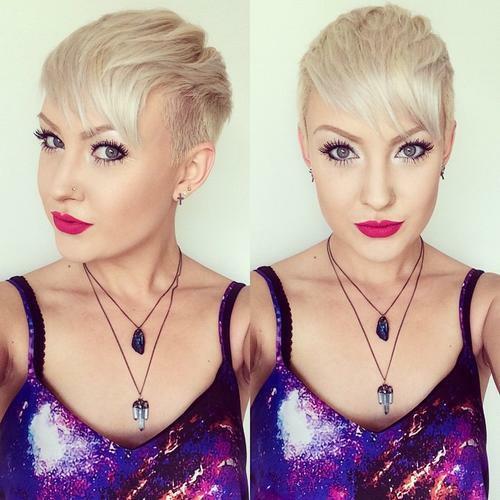 This beautiful ice blonde pixie crop is simply fabulous. With a long sweeping fringe and incredibly cropped sides, this stunning ice blonde haircut is absolutely gorgeous on this stunning lady! She’s highlighted her icy hair with a shock of pink lipstick and bold eye make up to really bring out her amazing features and showcase how beautiful face. 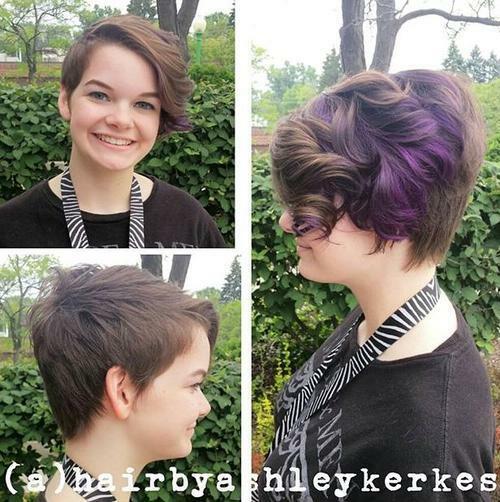 This stunning asymmetrical pixie crop is absolutely beautiful with a colour scheme of chocolate brown and purple! Cropped short and close to the head on the left hand side and finished with a beautiful and curly sweeping fringe on the right with a shock of purple, this gorgeous style is cute and colourful – perfect to showcase your personality. This fabulous caramel crop reminds us of Rihanna – and that is in no way a bad thing! 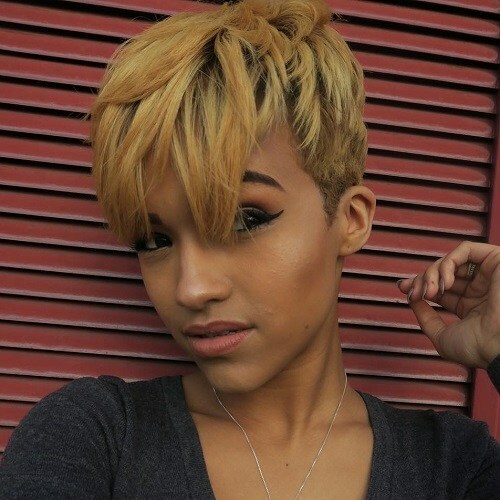 This gorgeous caramel toned pixie crop looks absolutely stunning on this beautiful girl, the colour compliments her skin tone absolutely perfectly! The cut is sleek and smooth, with a longer fringe and a shorter crop around the back of the head – we adore it. 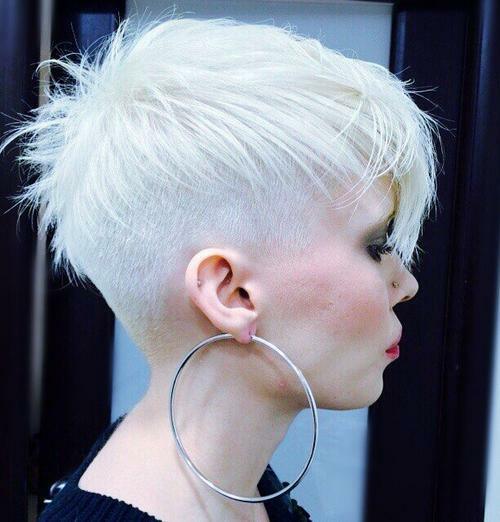 This white pixie crop is an absolutely beautiful cut which is low maintenance and high impact – aka the ideal haircut. 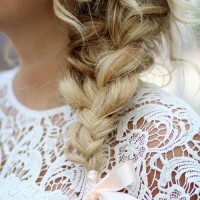 Cropped short and close to the hair and dyed a bright white, this gorgeous look is simply stunning! We love how the fringe is short but frames her face in a fabulous slant, highlighting her wonderful eyes and beautiful features. 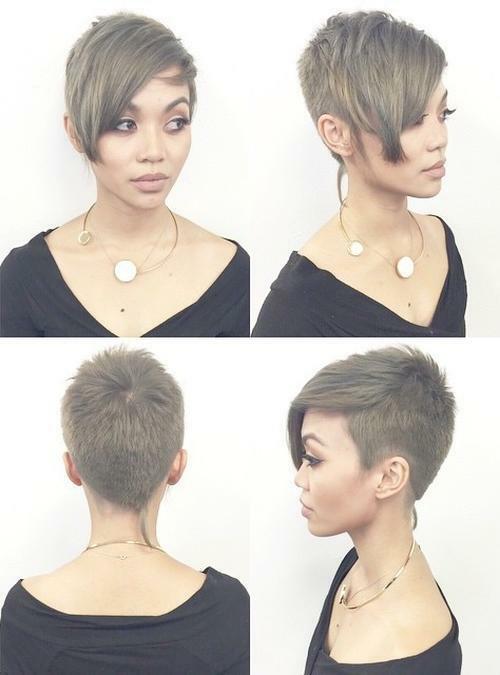 This gorgeous ash brown pixie crop is such a unique colour and we just love it! 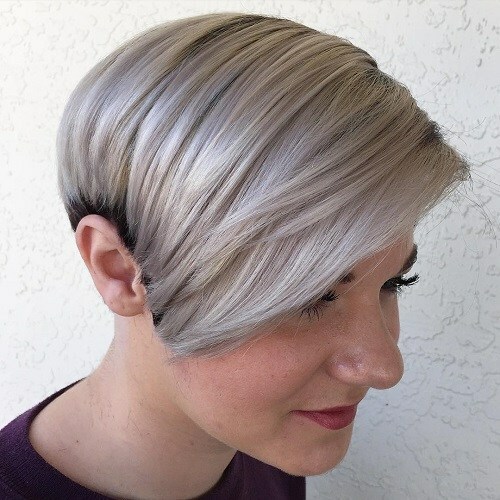 With a stunning ashy tone, this beautiful pixie crop has a sweeping long fringe and is then cropped incredibly short and close as a beautiful contrast. Finished with a completely unique long strand of hair that falls down her neck, you won’t forget this cut in a hurry! This amazing bubblegum pink crop simply demands attention – and when your hair is this fabulous, how could you not deserve the amazing attention? This beautiful pixie crop is finished with a fabulous quiff – a great alternative to a traditional fringe that we often see with pixie crops. This colour is vibrant, beautiful and oh so stylish. We love it. 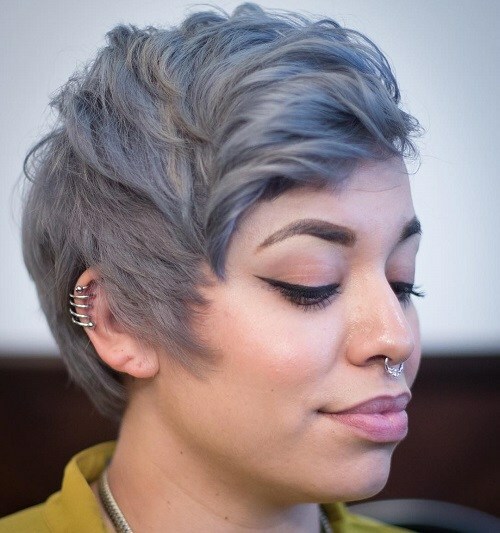 This stunning pixie cut is a unique colour combination of blue and silver and we think the finished result is pretty remarkable. This cut is finished with several stunning angles that finish perfectly around the ears. It has a cropped cut all around the back of the head but is finished with longer layers at the top. We just adore this stylish look! This pixie crop is a simply astounding colour combination of rich dark brown and a gorgeous caramel tone. The bulk of the cut is in a stunning brown and cropped short and close to the head, but the long, curly and sweeping fringe which frames the face to perfection is highlighted with a stunning caramel blonde and we just adore the combination. This beautiful crop is modern and unique – and we just can’t get enough of it! Clipped incredibly close to the head on the bottom layer, then with a longer layer on top that is primarily black and finished with extremely light touches of a vibrant blue and a beautiful purple colour too. We absolutely love this stunning fringe section on this cut, don’t you? This beautiful pixie cut is finished with amazing and vibrant flashes of bottle green – not your typical colour combination, but we think that it absolutely just works. 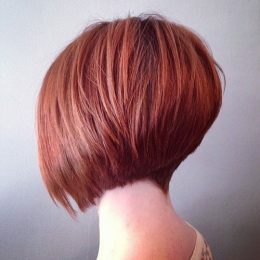 This cut is short and choppy, and we absolutely adore the sweeping fringe detail which helps this woman stand out from the crowd. The green hair perfectly compliments her green eyes. We love this gorgeous, gothic and glamorous pixie crop! This beautiful glossy black cut is asymmetrical, with a short left side and a lovely, long sweeping fringe on the other side. 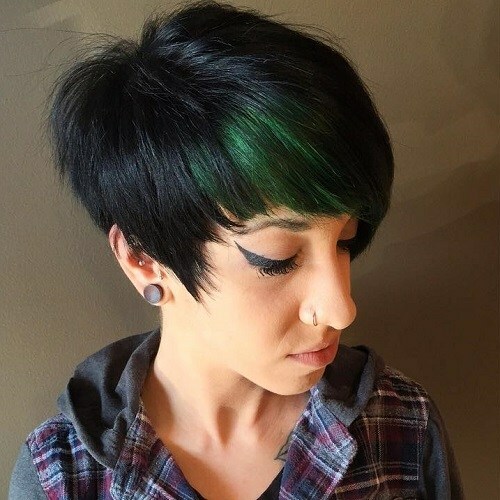 The fringe is finished with a bright green section that works perfectly against the jet black, and the cut is finished with short and choppy layers right to the top of the head. 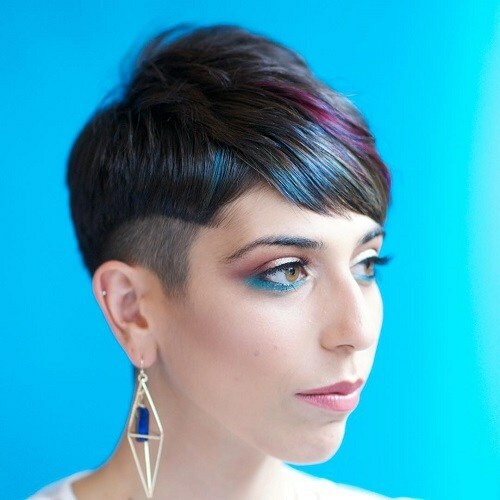 This absolutely beautiful bubblegum blue pixie crop is the pastel cut of dreams, don’t you agree? In a gorgeous light colour, this stunning crop is finished with subtle waves throughout the top of the hair and it creates a beautiful and bouncy finish. 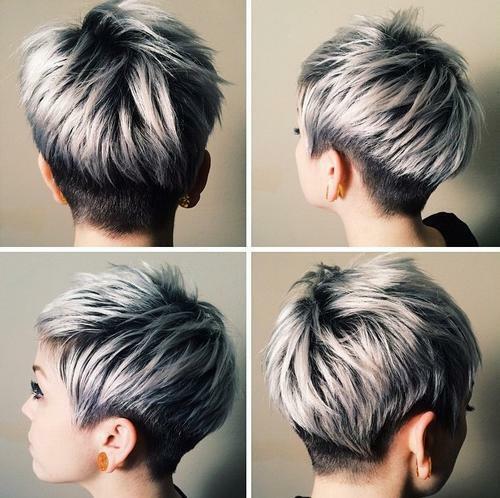 Pastel hair is a huge trend this year and this haircut is most certainly inspiring us to follow suit! This pink and purple pastel crop is giving us a large dose of hair inspiration. 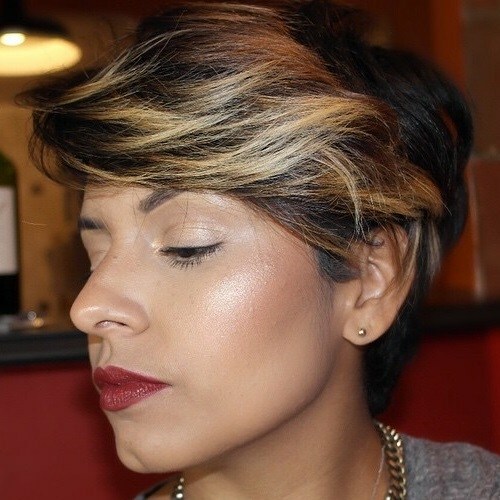 This stunning slanted crop is a beautiful and short cut designed to show off your face and highlight your best features. With a sweeping fringe it looks simply stunning! 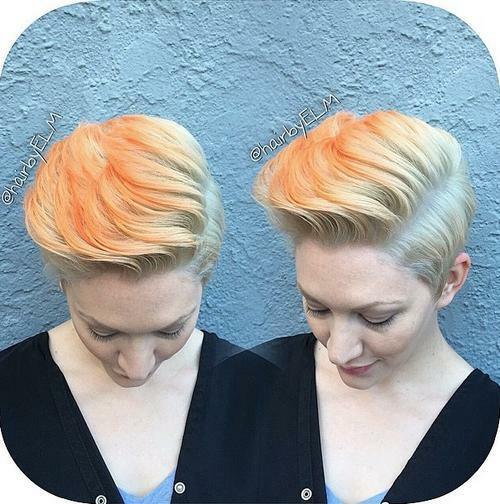 We absolutely adore the colours this lady has chosen to bring to her pixie cut. Bubblegum pastels are great! This stunning icy white cropped cut is edgy, cool, contemporary and stylish. 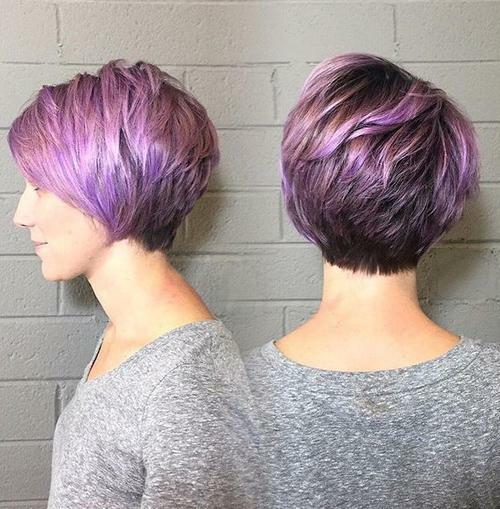 With an incredibly close shaved bottom layer finished with a light, longer, wispy top layer to bring body and texture to the cut, this pixie crop is truly unique and absolutely fabulous. The ice white colour is so striking – it’s a guaranteed way to attract attention! This gorgeous black and bubblegum blue pixie cut is a striking and edgy look that we just can’t get enough of. 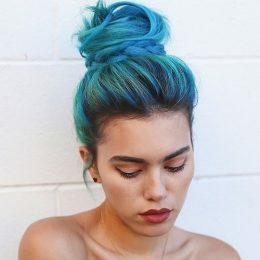 The bottom layer which is cut closely to the scalp is black, and the longer, sweeping top layer which forms the bulk of the hair and that gorgeous fringe which frames the face is finished with a beautiful bubblegum blue colour. 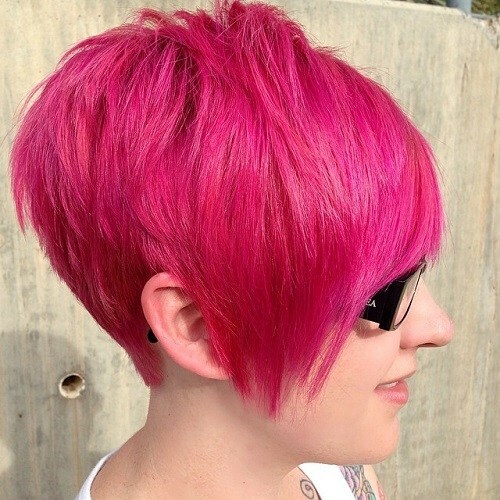 This breathtaking pixie cut is simply stunning, and we think the choices of colour are totally unique yet totally perfect too. This lovely lady has a gorgeous blonde natural hair, which she’s highlighted with a very subtle splash of baby blue and finished with a vibrant peachy pink along the quiff of this cropped cut. We love it, don’t you? The old saying goes ‘pink to make the boys wink’, and with hair this fabulous, we’re pretty sure everyone will be winking! 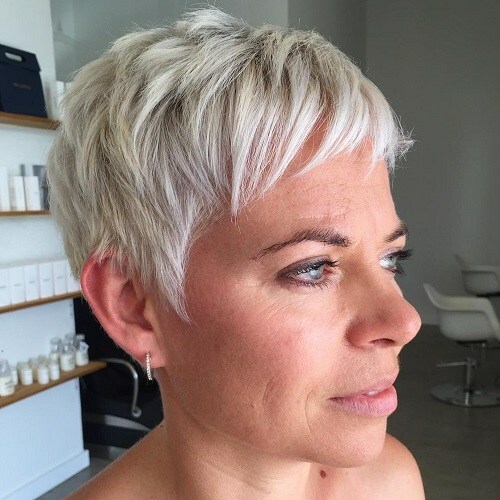 This cut is cropped short with lots of spiky layers around the back and the top of the head, and it falls with longer layers that form a beautiful fringe section around the face. 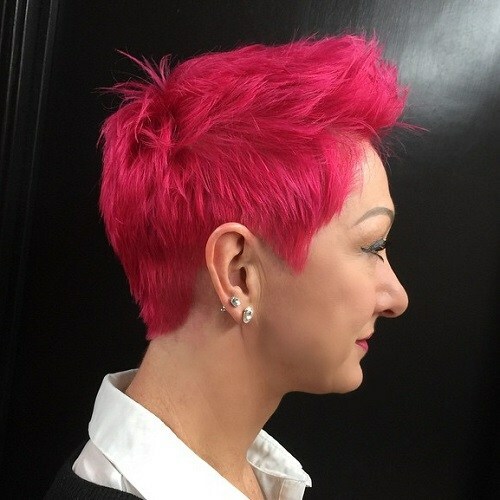 The flamingo pink colour takes this hair to the next level. 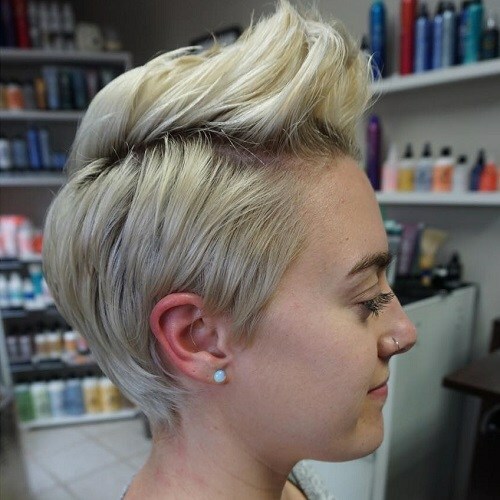 This bleached blonde pixie cut is a gorgeous and practical pixie cut that is perfectly practical for every day. A short and sophisticated cut, this look will be perfect from day to night. This lady has gone for a gorgeous quiff to accentuate her cut, showing off her pretty face and adding some excitement to the crop. We just love it! This silver and blue cropped cut has a pearly finish which we just can’t take our eyes off of – we just adore it. This beautiful sweeping cut is short, sweet and sleek, finished with a gorgeous long fringe. The top of the hair is worked with a pearly silver and blue colour that creates a beautiful pastel finish that is so on trend. This stunning chocolate brown cropped cut is a stylish and flattering cut that will show off all of your features! This lovely lady has gone for subtle lighter brown highlights to add light and body to this fabulous cut, which is finished with wonderful choppy layers that add plenty of texture. We love the hair colour against her orange toned lipstick! 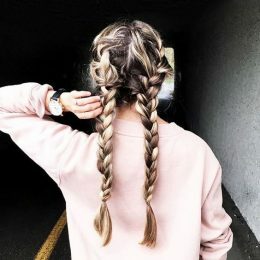 If you were thinking of cropping your hair short, hopefully this collection of stunning pictures has convinced you that you can do it with style. Styles Weekly seeks to bring you a range of on trend hair inspiration at all times so make sure to keep coming back!